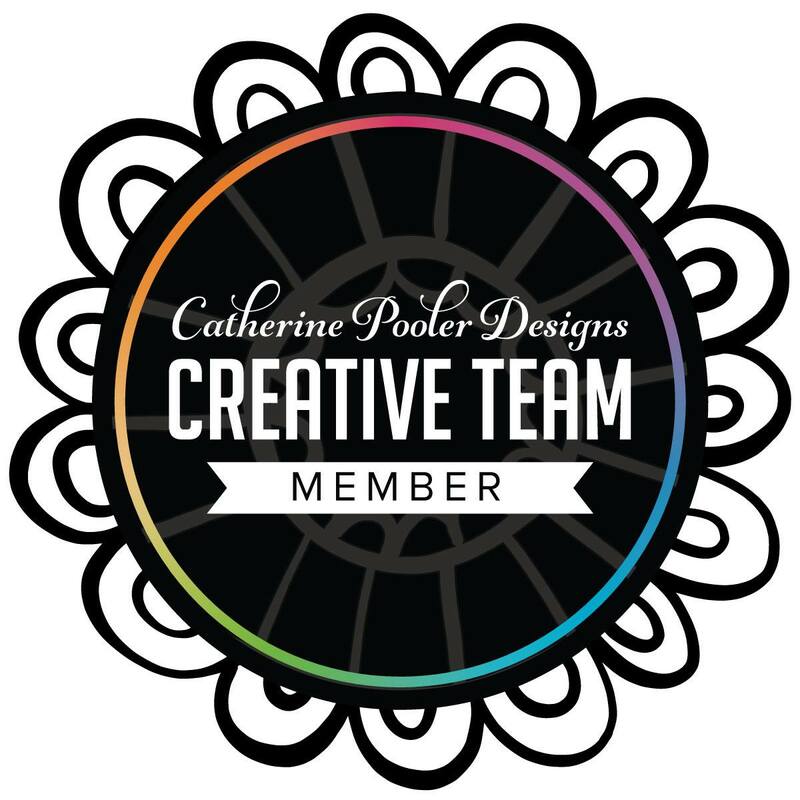 Jen's Ink Spot: Catherine Pooler Welcome Home New Release + GIVEAWAY! Catherine Pooler Welcome Home New Release + GIVEAWAY! 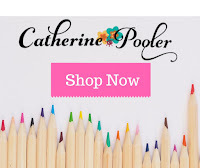 Welcome to the blog hop for the new Catherine Pooler Designs Welcome Home Release! All of the products will be available in the store on Wednesday, February 13th at 9 AM EST and you will be able to see all of the newly released products here at that time. 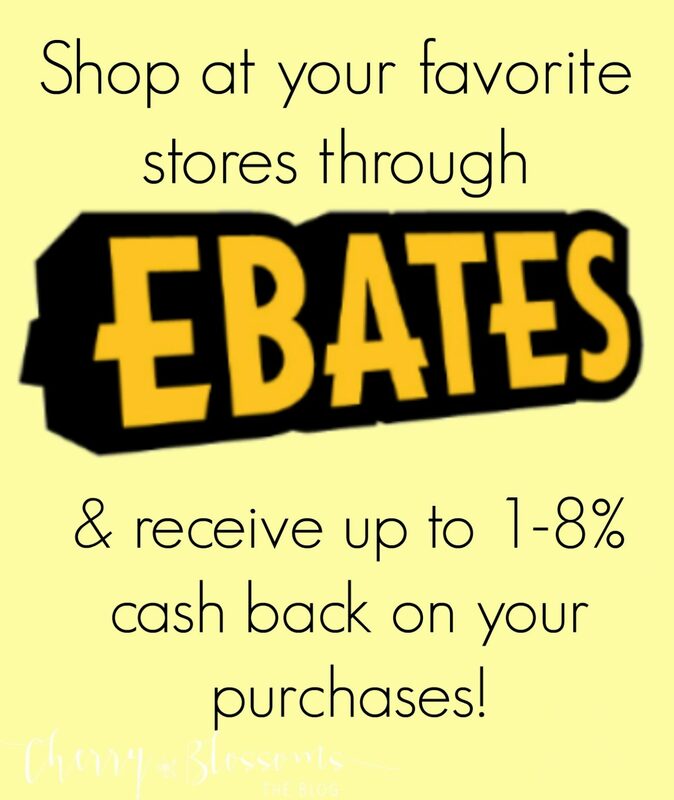 There are some beautiful new products available that you're going to fall in love with! I love ombre and when I pulled out the gorgeous new Rondi's Window Background stamp I knew that there were two things I wanted to do with it right away. One was to color it. The second was to emboss it on to an ombre background. To create the background I used It's a Girl, Be Mine, Mandarin Spice, Polished & Coral Cabana inks with a foam blender. I didn't use a heavy hand, but just inked lightly, moving up a little at a time. The colors made such a beautiful colored background. I made sure the background was completely dry and then embossed in white the Rondi's Window Background stamp onto the blended background. I die cut the previously released Awesome die from white cardstock and then "dipped" the bottom of it in VersaMark ink and embossed it with my favorite embossing powder Wanderlust. The "you are" sentiment is new and comes from a stamp set that coordinates perfectly with the die called Awesome & Wonderful stamp set. That new stamp set also coordinates with the previously release Wonderful die as well! The next set I'm featuring today is one that makes me long for Spring and warmer days! It is filled with cute Spring-like images! 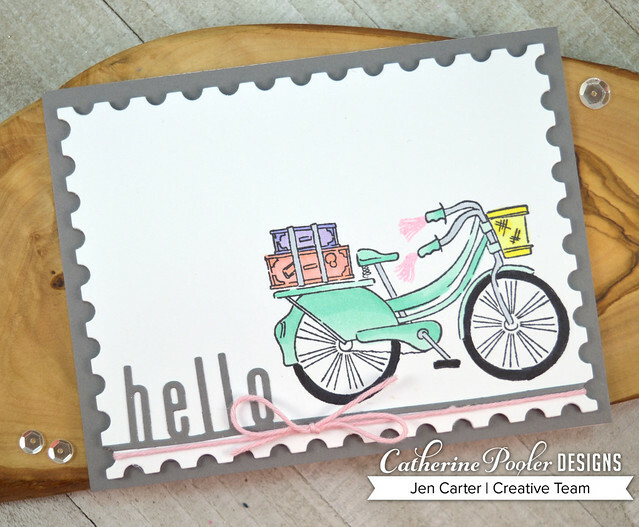 I stamped the adorable bicycle from the new Beautiful Ride stamp set toward the end of my cardstock panel so that there would be enough room for the sentiment. I colored the bike with copics. I also added the suitcases to the bike rack and colored those with copics as well. The adorable little bicycle streamers are a separate stamp also and they were stamped with It's a Boy ink. I really like the Ways to Say Hey dies and thought one of them would make a great road for the bicycle. I die cut the hello (yes, I got a little wobbly when I was adhering it and it's slightly crooked, oops!) from Smoke & Mirrors cardstock. I then die cut the entire piece with one of the Postage Stamp dies. The panel was adhered to another piece of Smoke & Mirrors cardstock. Be sure to come back tomorrow to my blog as I'll be sharing another card made with my favorite stamp set from the release (not shown here)! 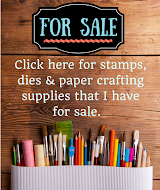 AND join me on Instragram on Wednesday for the release, another chance to win AND another card with my favorite new stamp set from the release! Jen, both cards are great. I can't wait to see the bicycle stamp set in its entirety. Also, looking forward to your favorite card tomorrow. I will be waiting anxiously for the postman to come! Beautiful ombré background! And that bike is too cute!! Love the Way To Say Hey Dies, sentiment stamps and dies are the best. You are wonderful with your ideas! Wow - That Rondi's background stamp is amazing! I really like your bike card too - that bike is like mine!! Just love how you colored and enhanced the bike. So cute! I absolutely love your bicycle card! This is going to be a very expensive release! Wow. Great cards! And so different from each other! I love that Rondi's window. It's first on my purchase list! Your cards are great - very cheerful and "springy"
The silver on the bottom of the letters is SUCH A NICE TOUCH!!!!! The ombré in that card is gorgeous and put some baseball cards in the spokes of that bike and it could be the bike I had as a kid, tassels, basket and all. I'm really liking the bicycle stamp set. The Hello Bicycle is so adorable. Beautiful cards! That Rondi background stamp is gorgeous. I love the pastel palette you chose against the grey on the bicycle card. Jen, your cards are so pretty and like how you did your embossing on the first card. Thank you so much for sharing and got to love everything about this New Release loving the die-cuts, Wow! Your cards are amazing! Wonderful background stamp! Great cards, Jen. I love that bicycle stamp set! Can't wait to order this whole release. Thanks for sharing. Wow, a beautiful card for many reasons. AWowsers - love that ombre card. Loving that background stamp - pretty cards! Thanks for sharing! I too love ombre but I seldom create it. It should correct that. Love the ombre colors in the first card. and the packages on the rack are great. Love the background stamp. Great card. These are such wonderful designs. I’m looking for to seeing more of this release. Very pretty cards! Love the peachy pink ombre! The background stamp is gorgeous! How adorable this bicycle card is! Love the postage stamp dies too! I love both cards and the postage die is one of my favorites from a past release. Beautiful ombré. I love, love, love the ombre card, that stamp is gorgeous. I love the vintage looking bike!!!!!!!! Gorgeous~! I love the bike one.... simple and sweet! I love the ombré card!!! So darn fun. Loving that monochromatic beauty!!! Beautiful cards! Love the background stamp and how you embossed the sentiment die cut. The bicycle is just so cute! Both your cards are lovely. Loved the colors in your ombré cards!! So cool!! Your bicycle card is adorable!! Love your cards! I can see I will get a lot of use out of the Ways to Say Hey dies, too! You taught me something new! Never thought about embossing only part of a die cut sentiment. Hope to try it soon! Love your cards and I so agree, the Hey die works perfectly with your bike card. Gotta love that bike! Thanks for sharing. I love the ombré and the dies on a line. Sooooo CUTE! That bike is just adorable and the ombre effect on Rondi's Window is stunning. Awesome cards. Everything I've seen made with the rondi's window stamp is just beautiful. Love your ombre effect. I agree with the other posters who mentioned how great the silver edging on the bottom of your letting turned out! Thanks for the inspiration. Fabulously fun and fresh cards! Beautiful designs. Wonderful cards. I like how you created the background on the first one. They're both lovely! I love the little touch of glitter you added to your sentiment! Two beautiful cards. Well done. I am going to try the background you have on your first card. Just lovely! The ombre card is blended so well. I love the color used. I have other bicycle stamps, but this is by far my favorite. There are so many options. Beautiful designs! Love that fun bike! You always have such fantastic inspirational ideas!!! Jen, your projects are fabulous! This is such a fun release :)! That bike image so adorable. I like the "ways to say Hey" - - they add just the right touch. Oh my gosh Jen, I LOVE those pink tassles on the bike!! And that hombre on the first card is gorgeous!!! LOVE them both! So many great techniques I can't wait to try. I never thought of embossing just part of a die cut before, can't wait to try it. Thank you so much! Both cards are beautiful. I love how you did the background using the new rondi's window, but that bike is to cute!! Love both of these!! 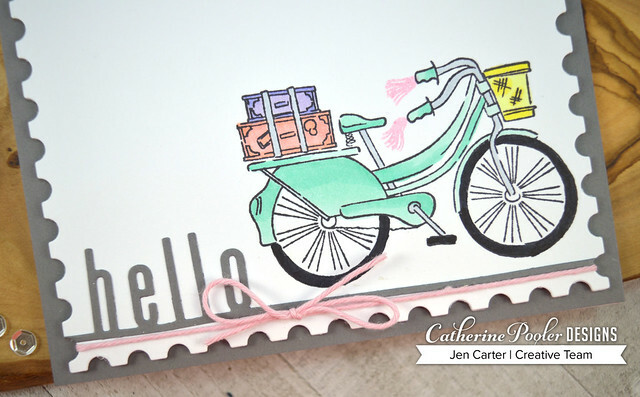 Always love a good background stamp with ombre inking & that bike is so cute!! Anxious to see the Beautiful Ride stamp set.